Yep you did indeed read the title correctly. Now gluten free donuts ( until recently) have been a bit like unicorns – not real, mythical and things you can only dream about. In fact there are 2 delicious producers that I recommend these are Borough 22 and wheat free bakery direct. Check them out if you can ( btw this is not an ad I just really like these). Any way I’ve digressed, for Christmas I got a mini donut maker. I mean I got a fab new bag as well, not just this electrical item, but I was impressed with it. This got me thinking will gluten and dairy free work? Only one way to find out…..
By golly it did, want to know how I did it?? Have a read below. 1tbs butter or dairy free butter melted. mine takes about 3-4 minutes to cook the little lovelies. Either toss in cinnamon sugar, or ice however you fancy. 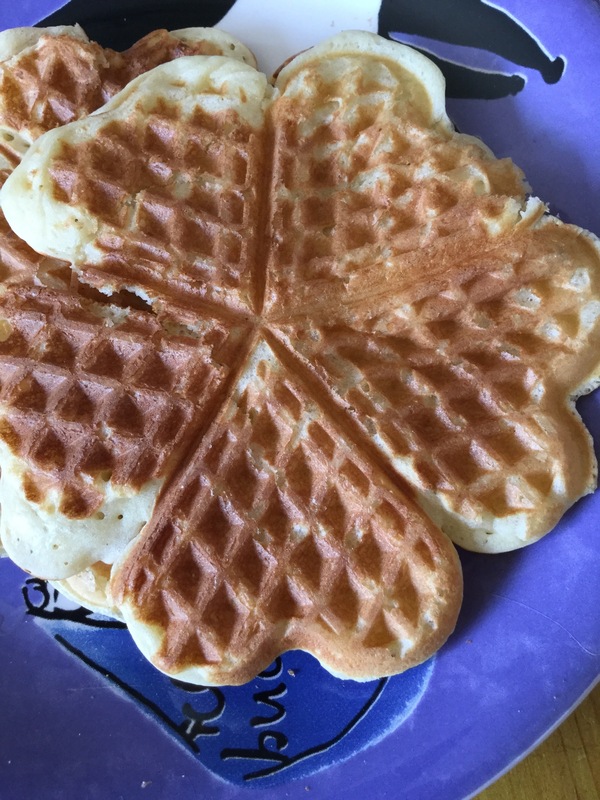 There you go, so easy, and so tasty. Even my husband ( who hates donuts) said they were good. Well it’s most definitely getting colder, and autumn has set in with considerable force. The chickens did not like Ophelia the other day, poor things resembling feathered ping pong balls. They were wise and retreated to their run, likewise we battened down the hatches and stayed in the warm. The other day I spotted this apple pie in the fresh free from counter in Sainsbury’s. It’s the right time of year for fruit pies, and my pastry is usually hit or miss so I thought I’d give this a go. Like a lot of gluten free products this is best eaten warm so 15 minutes later out it came looking all golden and tempting. So did it pass the taste test? Mostly yes. The pastry was lovely and buttery, with no soggy bottoms here although I didn’t particularly like the sugar on the top, it gave a texture that was grainy and too crunchy for my liking. The filling is generous and has a good tang with I think a Bramley apple filling should have. You can actually taste the apples, this is a bonus for gluten free- I do feel some brands over compensate with sugar, instead of trying to perfect taste. On the whole I was impressed and despite the crunchy topping I would buy this again. It’s great if you are in a rush and need a dessert or ( like me) pastry isn’t your strongest point. Have you tried these apple pies? Or anything else from the Sainsbury’s range? Let me know in the comments below. Disclaimer: This is NOT a sponsored post. I purchased the items and all views are my own personal ones. My Daughter is Thomas mad, I mean obsessed with Thomas. We had a disaster of a holiday, resulting in a broken narrow boat and being stranded by a lock ( thanks Hoseasons) so to make up for said disaster we had our first trip to Drayton Manor Park. Munchkin spent the first hour in a mixture of excitement and amazement, and I have to admit it brought back nostalgia from school trips and summer holidays in my teenage years. Thomas Land is fantastic, lots of rides all perfect for little ones, plenty of photo opportunities and trains, lots of trains. Personal highlights are the Troublesome Trucks, and Winston’s Car ride. We loved it so much we booked an over night stay a few weeks later in the hotel for the much anticipated 4th Birthday. Fast forward to this point, the check in was smooth and very easy. For £30 extra we were offered the themed Thomas bedroom. We said yes- they are amazing from Thomas bunk beds, stunning painted walls, track carpets and breakfast with The Fat Controller the next morning I’d really recommend a stop over if you can ( this is not a sponsored post it REALLY is that great). This leads me on to eating in the hotel and park. In every outlet there is full allergen menus, many you do t need to ask its all displayed on the walls. This is from The Burger Kutchen, an actual burger that’s both gluten and nut free. Thumbs up all round ( delicious it was to). The Grill in is another excellent choice. Both chef and magnet sign to say your food is safe to eat. They even did a extra safe special treat for mini me on her birthday. We were so touched and could not sing their praises higher. I really recommend you go for a day ( or two) to Drayton Manor it’s great fun for all, with or with out allergies. Disclaimer: This is not a sponsored post. It’s all my own views and I was really impressed. 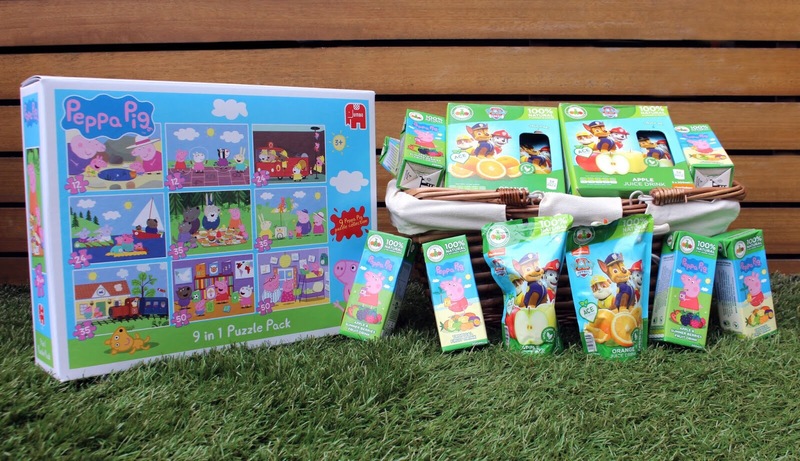 Appy Kids Company Juice Review and Competition. See all this in the picture above? It could be yours but we will get to that later. You may ( or may not) know that I have a munchkin, and I may have commented on the fact she loves Peppa pig and Paw Patrol once or twice. I know I’m not on my own, most children go through a Peppa stage I think. Anyway the lovely people over at Appy Kids Co contacted us asking if we would like to try these juices, not only that we have collaborated to offer you all the chance to try them to. If you hadn’t guessed already Appy Kids sell licensed character juice drinks, which are made with natural ingredients and in ranges such as Peppa, The Gruffalo, Minions and Paw Patrol. We had the Orange Paw Patrol pouches and mixed berry Peppa cartons to try. They are all much lower in sugar, (see Here for typical ingredients list) suitable for most diets and contain added vitamins as well. 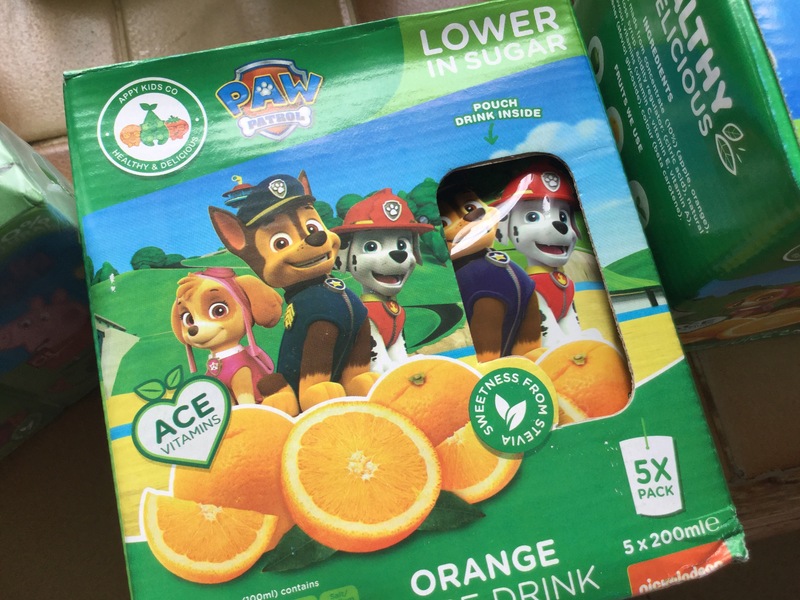 I was happy for LR to try these, I’m always conscious of sugar content, in terms of teeth health and diet but 3.75g per 100 MLS is around about what these drinks are, which is so much better than some on the market- it’s a win for mums, and kids alike. So how to they taste? Im Pleased to say LR liked both, her favourite is Paw Patrol ( I suspect Chase on the front has something to do with it). Mind you she drank both and has gone back for more on different days. I take this as a positive- wild horses would not make her eat or drink something she doesn’t like. Her only criticism was that Rubble was missing from the front of the carton, but taste wise it’s all good. For research obviously I had a few sips to. Both are very tasty and refreshing. I like the fact they don’t leave that horrid artificial after taste in your mouth. They don’t cause a sugar rush after either, so that alone is a thumb up from me. Perfect for the back to school lunch boxes. ( yeah I know 5 wks- you’ve got this). Winner will be drawn at random next week. Good luck to you all.